Doris Day - 39 Movies in 20 Years! Doris embodied an image she never truly understood, and for much of her life, she sought a family ideal never achieved, becoming, in the process, the biggest box-office draw in the movie business at one time before choosing to step away. Doris Day became a phenomenon of sight and sound, a hit song machine in the first part of her career and, in the second, Hollywood's No. 1 female box-office star and the epitome of the girl next door. Her composite film résumé became an American archetype - the pristine, bright-eyed sweetheart of America's neo-Victorian 1950s, even if she was far from her on-screen type. Though often successfully paired with leading man Rock Hudson in a series of iconic romantic comedies, off-screen she longed for what her characters always seemed to get in the end: the simple, stable existence of a housewife tending her corner of the American Dream. In these pages, you will have the opportunity to see what made Doris tick in her films: from the early ones in the late 40’s and early 50’s, to those that made her the biggest star on the screen from the late 50's to the mid 60's. Take a stroll down movie lane and get in synch with the true essence of Doris Day as movie star. Check out our link to the Top 20 Girls Next Door in Movies. Guess who is number 1! Will the Academy of Motion Picture Arts and Sciences ever get it? "No More Que Será Será: Give Day Her Due!" 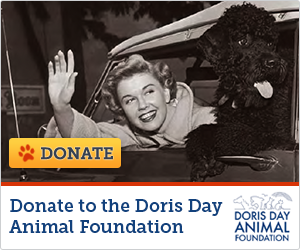 Visit our co-stars page for more info on the wonderful actors and actresses who starred along with Doris. We will be adding more every week.